Depending on the order in which you have done the other Time Trials, you may have unlocked some of the more powerful cheat codes. If you're playing the levels in order and have only beaten Bolivia and Peru, you will at least have unlimited SMG ammo. If you find this level too difficult even with this weapon, maybe you can try to finish some other Time Trials before starting this level to unlock some more powerful cheats. 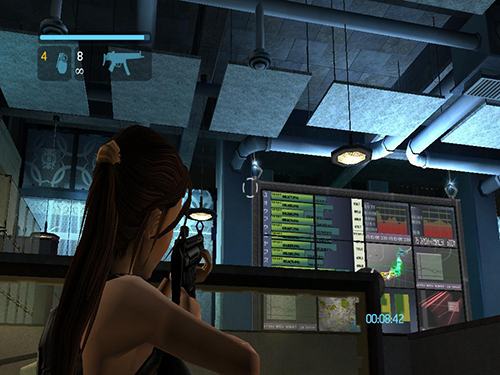 Still, I have some very good strategy for this level that will leave you 5 minutes to fight Takamoto at the end. 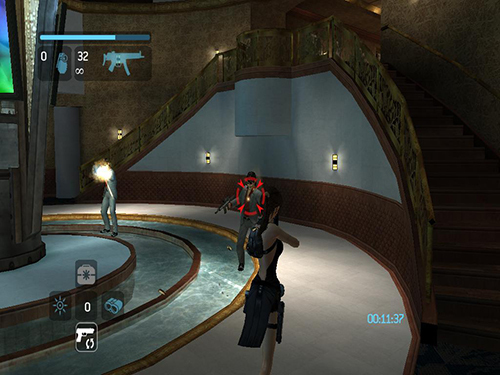 There's no way to make Lara move faster when she's wearing the evening dress. So try to take the most direct path to the bartender, then to Nishimura's office. As soon as level starts go down the stairs on the left side to reach the bartender faster. 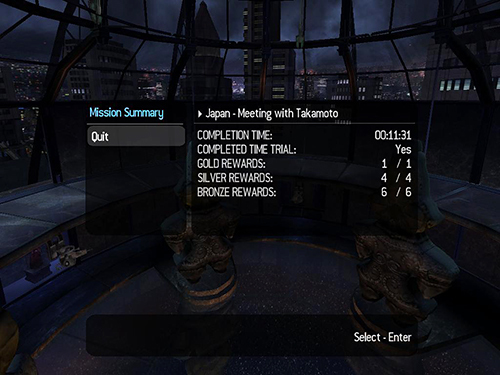 Press Interact to start the conversation and immediately head for Nishimura’s office. There is no need to wait until the conversation is over. 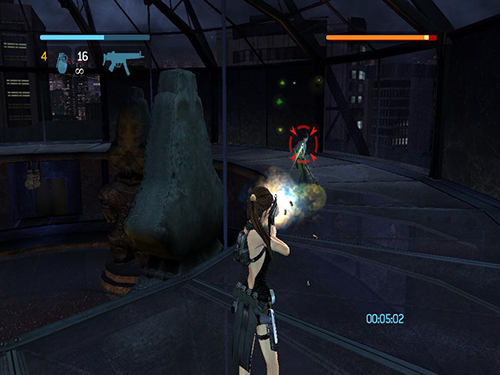 As you go through the level, you can avoid most enemies. Where you have to fight, make sure you pick up ammo, grenades, and health packs from dead enemies. You'll need them for the final fight with Takamoto. 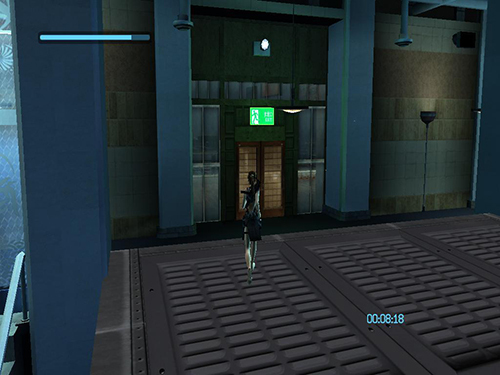 Now that Lara can move freely, be sure to roll along the hallway to reach the elevator faster. Focus on your main goal on the roof and ignore everything else, missed artifacts, etc. Make sure to tap Interact to climb faster while on the vertical pipe. 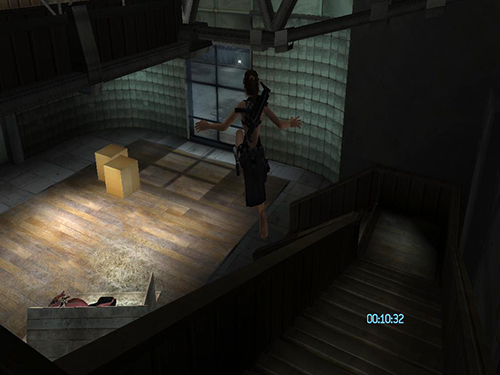 Once you are inside this building, you can jump from this spot instead of taking the stairs all the way down. Lara won’t lose health. Be careful not to fall down here and just as before ignore everything that is not important at the moment. Just make your way through this area as fast as you can. Try to stay relaxed as you jump and grapple swing. It's better to spend a few extra seconds setting up a jump than to fall and have to reload. You don't need to kill those guys. Just roll past them to the door. They won't follow you once you are inside. Roll up the stairs to reach the top much faster. Now you will probably say that this room is not going to be very easy, well it is very easy. 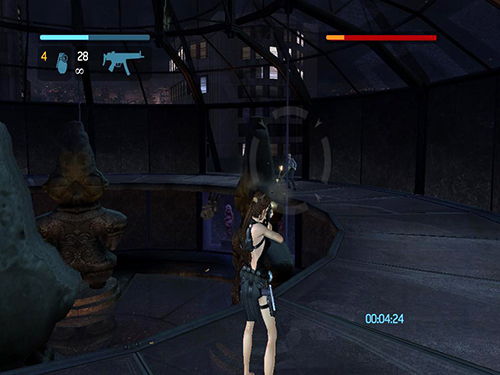 Just stand at the point shown in the screenshot below, switch to Manual/Accurate Aim, and shoot the rings on the big-screen display. Then use the grapple to pull it down. You can then ignore the enemies that appear. There is no time to fight with them since you will need as much time as you can get for the Takamoto battle. Just destroy the display and get out. 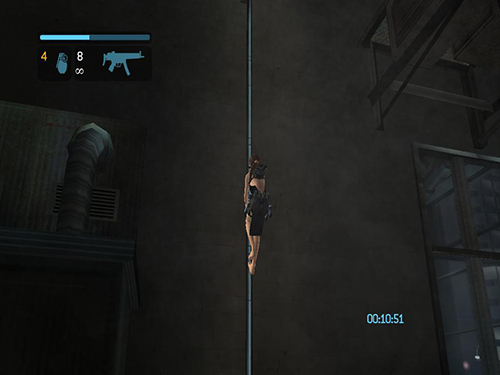 Again, tap Interact to climb the pipe faster. 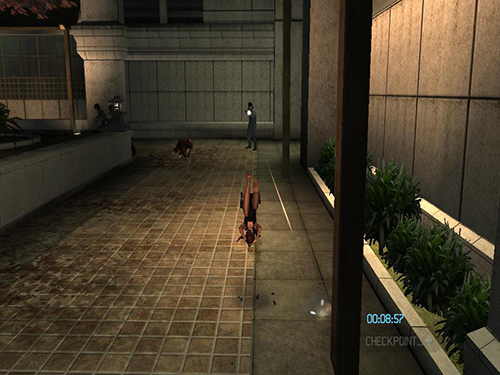 "Fast Traverse" along walls and ledges. Again, try to stay calm as you climb and jump. If you try and go too fast, you may get careless and fall. Again, ignore everyone inside the building. There is no need to kill them, just roll through to the next room. Once you are behind the glass doors they won't go after you. 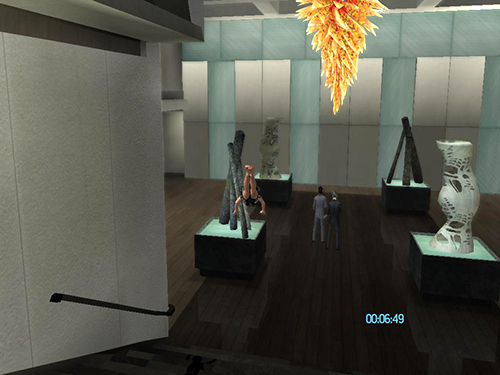 You must kill those guys with shotguns in the room with the hanging dragon and the hallway near the elevator. Do it as fast as you can and be sure to pick up any health packs they drop. 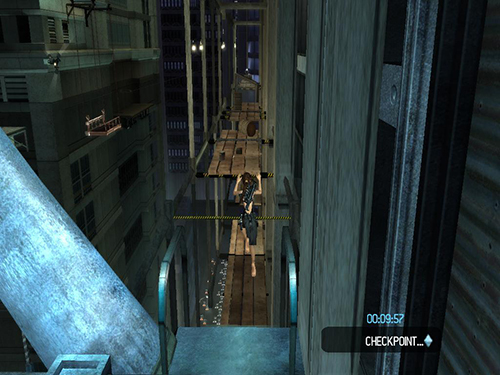 So, the strategy for Takamoto is to kill him on the upper level. 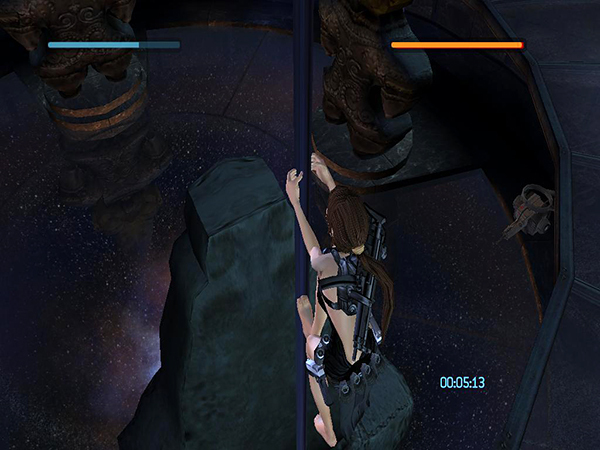 So skip the cutscene, roll behind one of the statues to avoid the gun turrets, and tap Interact as you climb the pole to go faster. The SMG is a strong weapon, but you will need to be closer to him if you want this to work. 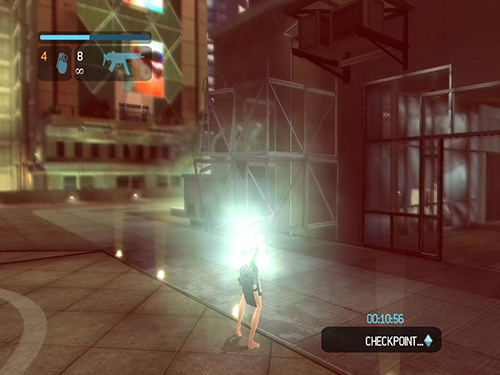 Try to avoid the green blasts from his artifact, and shoot while you are running towards him. If you have done well up to this point and saved time by avoiding most of the enemies, you will have more than 5 minutes for this battle. This should be enough even if you die once or twice. 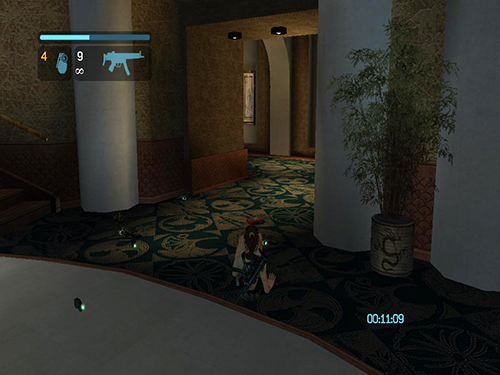 Still, if you can't beat him with grenades and SMG, try to finish some of the other Time Trials to unlock better cheats, like Bolivia Redux for the One-Shot Kill and Nepal for Excalibur. Then try it again.